Rio de Janeiro: Sakshi Malik on Wednesday ended India’s painful wait for a medal at the Rio Olympic Games 2016 by clinching the bronze medal in the 58kg women’s freestyle wrestling category, pulling off a sensational 8-5 victory over Aisuluu Tynybekova in the play-off bout. India's Sakshi Malik poses with her bronze medal for the women's wrestling freestyle 58-kg competition during the medals ceremony at the 2016 Summer Olympics. The 23-year-old from Rohtak became only the fourth woman athlete from India to win an Olympic medal as she earned the dramatic win after falling behind 0-5 in the do-or-die bout on Day 12. Weightlifter Karnam Malleshwari (2000, Sydney), boxer MC Mary Kom (2012, London) and shuttler Saina Nehwal (2012, London) are the only other women players from India to have won a medal in the Olympics. Like in three of the four other bouts earlier in the day, Sakshi won the crucial bout after coming from behind. She, in fact, had lost 2-9 in the quarter-finals to Russia’s Valeriia Koblova in the fifth bout of the day before getting a second chance in repechage when her conqueror reached the final. Sakshi’s victory brought cheers to the Indian contingent that had endured an agonising 11 days without a medal. Sakshi turned the tables on the Kyrgyzstan wrestler in the dying seconds of the bout even as Tynybekova was in complete command in most part of the clash. Tynybekova grabbed Sakshi’s leg and quickly earned two points before adding one more. She repeated her move and successfully bagged two more points to lead 5-0 at the break. 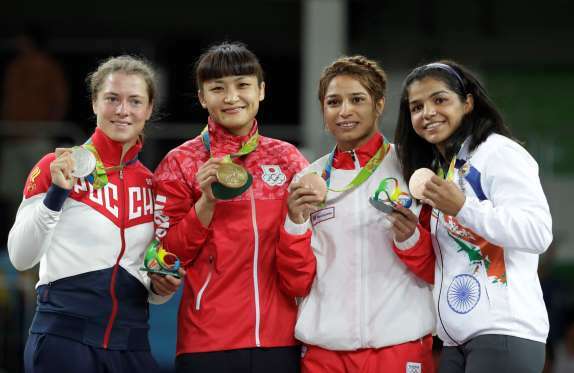 Russia's Valeria Koblova, from left, silver medalist, Japan's Kaori Icho, gold medalist, Tunisia's Marwa Amri, bronze medalist, India's Sakshi Malik pose during the medals ceremony for the women's wrestling freestyle 58-kg competition at the 2016 Summer Olympics. Sakshi could open the scoring only in the second period and got two points after throwing her rival down and out of the mat. She then managed to earn two points again with a similar move to bring down the margin to 4-5. Thereafter, it was no looking back for the Indian girl and she took the opponent down to level the scores 5-5. But she did not stop there and gained three more points by pinning down the Kyrgyzstan wrestler in the dying moments of the match. 0 Response to "Wrestler Sakshi Malik wins India's First Medal"